Here are 10 rules to make your christian marriage stronger and smoother. The Bible says in Ephesians 4:26 to not let the sun go down while you are still angry. Make it a goal to clear the air with your spouse on a daily basis. Fortunately, most days there will not be a need to clean the slate. For those days where tensions are high make an agreement with one another that you will work out your differences before going to bed. The Bible says that it is a man’s responsibility to love (Ephesians 5:25) and it is a woman’s responsibility to submit (Ephesians 5:22). If the husband will commit to love then it makes it much easier for the wife to submit. If the wife will submit, the husband will have less trouble loving her. The beautiful thing about this is that God does not say, “a man should love his wife if she will submit.” Or, “a woman should submit to her husband if he loves her.” Each spouse’s responsibility is independent of what the other one does. When a couple looks at marriage as a 50-50 agreement then they will always play off of how the other treats them. However, when they see the marriage as their sole responsibility, then they will have a much stronger and happier marriage. Don’t share your marriage problems with your co-workers. If you are seeing a marriage counselor then it is important to be open and honest. But when chatting with your friends at the water cooler or the hair salon, you need to guard your negative words about your spouse. Long after the problem is resolved your friends will remember. They weren’t part of the healing process and therefore they won’t know how to forget. One of the major causes of divorce is money problems. Live with the money you have. Even though you think that expensive gift (that you can’t afford) will help endear your spouse to you, it more often than not will drive a wedge of insecurity in your relationship. Never enter a marriage with the thought that you can get divorced if things don’t work out. Regardless of your interpretation of the biblical passages dealing with divorce, you should make it a personal commitment to your spouse and to God that you will not consider divorce as an option. Enter the marriage with the understanding that you are making a solemn vow before God to your spouse that you will stay together until death separates you. Protect your eyes, ears and mind. Men, you need to learn to look away when your eyes are drawn to other women in an inappropriate way. Ladies, you may hear sweeter words from your co-worker than you do from your own husband. Remember to whom you made a promise to love—even when times are difficult. Isn’t it amazing how, all of a sudden, you can remember things from the past that you thought were forgotten when an argument arises between you and your spouse? Forget the wrong that he or she has done to you in the past and focus on the present and future. The word “compliment” can mean a couple of different things. First it can mean to say nice things to one another. It can also mean to do something that helps the other to be stronger or look better in the eyes of others. Both senses of the word compliment are important in a marriage. Make a decision to love one another as much as you can. Remember that he/she is your partner whom God gifted for your entire life on earth. God picked him/her just for you from among all the other faces, to become a part of you in mind and body. Most people who want to protect their marriage will say that their spouse is more important than their job. Unfortunately, it seems that people who are in ministry (pastors, missionaries, etc.) will say that in a list of priorities their wife is sometimes at the top of the list and sometimes their ministry is. If you put God at the top of your priority list, He will show you where your emphasis should be at any given time. If God is truly first, then the other priorities will fall into place. 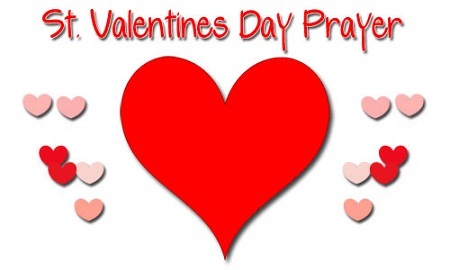 Dear loving Father, thank you for Saint Valentines Day when we celebrate and share love. Thank you for that love goes deeper than romance and that, through Christ, all love grows deeper and stronger daily. I thank you today for the following people who have loved me unconditionally no matter what happens in my life (specify each one of them here and thank God). Thank you for the special love of family members. Thank you for the elders in my family who have taught me how to love through thick and thin, even when the word “love” wasn’t specifically spoken out loud. Here is one special act of love they taught me that I want to pass on to others (specify the most memorable special act of love you remember in your life). Thank you for the pure, open-hearted love of young children. Thank you for scribbled drawings, sticky hugs and wet kisses on the cheek. Here are the ways I would like to be more like a child in sharing love with others (specify how you plan to show innocent love to others around you). I often need help in expressing love. I want to find the right words to say and also the right deeds, prayers, support and encouragement to share. May your Holy Spirit guide me to be part of your perfect timing in showing others I care at the very moment of their greatest need. Please bring to my mind one such divine deed as I listen for your guidance (remain calm praising God as you listen for His voice). Teach me to love myself. Help me to do healthy, nurturing things for my physical, mental and spiritual well-being. Here is one issue I need your help with so I can better love and care for myself (specify your issue). Sometimes I have a hard time loving everyone. Give me strength and grace to love the following people (specify the people whom you hate or dislike). Thank you for hearing my prayer and empowering me today and forever with the great love of Jesus, who died for me and for all of his other beloved children here on earth. Jesus, I love you.